Peak Oil Debunked: 119. WILL THE WORLD PEAK WHEN GHAWAR PEAKS? Did Saudi Arabia peak in 1981? No. Did the world peak in 1981? No. Isn't that amazing? Texas has a water cut of 92%, and Prudhoe Bay has a water cut of more than 75%. How come the gold bugs and the profiteers aren't shrieking about the imminent collapse of Texas and Prudhoe Bay? b) Ali Daneshy, director of petroleum engineering at the University of Houston. Also, referring to P. 306 of the DOE's Annual Energy Review 2004, we see that, in 2004, Saudi Arabia produced 9.1mbd and Russia produced 8.8mbd. So why aren't we all getting hysterical about the Russian peak and Russian horizontal wells and Russian water cut? How come the sound bite isn't: "When Russia peaks, the world peaks"? I'll tell you why: This isn't about logic, it's about Matt Simmons' obsession with the Saudis. Why is he so obsessed with the Saudis? Because he's one of those Americans who think they own Saudi Arabia. They think Saudi oil is their oil, and they don't trust the Saudis with their grubby hands all over it. So does the Koppelaar report still stand? Are we still looking at a 2010-2015 world peak? Say the Hirsch report is sound, and the Koppelaar prediction of a 2010-2015 peak eventuated, which leave us no more than 10 years left to mitigate. That could (according to Hirsch's report) still mean a very dire outlook in the years to come. JD, what would your suggestion to the Joe public be on how to protect themselves and prepare for it? "How come the sound bite isn't: "When Russia peaks, the world peaks"?" Correct me if I'm wrong, but isn't Russia has already peaked, and SA has not. I think the argument is that the majority of non-OPEC have peaked. A few OPEC countries have or about to peak. That leaves SA the single largest producer with the most growth left, and when SA peaks, the world peaks. JD, how come you conveniently missed out the letter Simmons wrote to the very same website you quoted the Ali Daneshy's letter from? So does the Koppelaar report still stand? I personally put a lot of credence in it. Get rid of your car, or buy a scooter. Take the bus. Car pool. Move closer to work. Telecommute. Wean yourself off oil. If you live in the U.S., wean yourself off natural gas too. Use an electric space heater to heat a small room where you sit instead of a whole house. Buy a blanket and turn off the heat while you sleep. Garden. Make a compost heap. Get in shape. when SA peaks, the world peaks. Koppelaar investigated that question with the numbers, and it doesn't appear to be true. See his paper, referenced in #86. If you want to call going from 12.5mbd in 1988, to 6mbd in 1996, to 9mbd (roughly equal to Saudi Arabia) in 2004 "peaking". It's a little atypical though because the "decline" is characterized by rapid growth. I was referring to the second peak, which hasn't happened yet. Clearly that would present the exact same challenges to the oil market as Saudi Arabia peaking because Russia and Saudi Arabia produce almost the exact same amount of oil. The comment on water cut from Ali Daneshy is rather strange. He talks about the water cut from two provinces which are far past their peaks and seems to suggest that since these are higher than SA then SA is fine. I don't see it like that at all. I also wouldn't be so quick to suggest that Ghawar has peaked. The last 15 years or so have been pretty flat. If a field can produce at a constant rate for that length of time I would not say it has already peaked even if that constant rate is less than what it has produced in the past. The decline from 5.7 million barrels in '81 to the steady state of 5mbpd more recently wasn't due to depletion it was due to choice. When people talk about Ghawar peaking they mean the production declining unavoidably due to depletion. That doesn't look to have happened yet (but Simmons is saying it could happen soon). It's suggested that due to the recovery techniques deployed Ghawar will deplete relatively fast (more than 2-3%). It's the idea of a 5mbpd province declining at 5%+ or more pa that has people worried. ...the Americans think they own Saudi Arabia. They think Saudi oil is their oil, and they don't trust the Saudis with their grubby hands all over it. You're overreaching there, JD. It's probably unwise to speak of "Americans" in general, given the country's last two presidential elections were whisker-close, and give the Congress is pretty closely divided. Not to mention the bias in the media and the political system that gives money so much influence. Consider: more people live in "blue states" than red, but the House of Representatives is busy trying to return us to the halcyon days of the robber barons. In 1973, when SA embargoed the US, there were some (marginal) calls for invasion, but the actual response -- by another Republican president -- was to muddle through. I think it's easy enough to explain Simmons's motivation without indicting the whole country. Thanks jkl. You're absolutely right, and I've tempered the language in the original post. I'm going to pile on the Ghawar hasn't peaked bandwagon and mention that the logic on this blog seems to be a little strained sometimes. I'm going to read on, but overall, not that convincing. My understanding is that their production fell over for a bit because of the USSR collapsing and associated political and infrastructure chaos, and now they are working up to a second smaller peak of about 10 mbd or something like that. At least, that’s what the Russian energy minister openly talked about. And JD, isn’t it a fact that Husseini, Aramco’s former head of exploration, told the NYT that Saudia Arabia probably cannot produce more than 15mbd? Other oil companies are spreading this vicious lie that EVEN THOUGH THE WHOLE non-OPEC WORLD is about to peak, SAUDI ARABIA WILL SAVE US! The reality is it might only have 5mbd extra development left. So as the entire non-OPEC world moves into decline, I find it doubtful that an extra 5mbd will prevent worldwide decline setting in for more than a few years. 1/ This will not prevent worldwide depletion occurring as non-OPEC nations move into decline. 2/ We will no longer be in an economy and era of ever increasing supplies and production of cheap oil. We will have peaked. We are not ready for the end of cheap oil! And almost every one of your so called solutions implies massive lifestyle changes and a huge shake up of the economy, even though you deny there will be a recession let alone Depression, which I find most likely. Your solutions are the very definition of a recession, but you deny negative economic impacts. Interesting. So can you see that arguing over the possible damage to or health of Ghawar kind of misses the point? It’s straining gnats while choking on camels… digging at splinters while blinded by a full on mote in one’s own eye… get the picture? We are talking about much larger numbers here… the sheer size of the Indian and Chinese consumer market that is gearing up for oil, which could bring on an ‘economic peak’ a lot earlier than any Ghawar peak considerations. However, when Saudia Arabia does plateau, even if it is a nice long plateau, that is when the world has peaked. 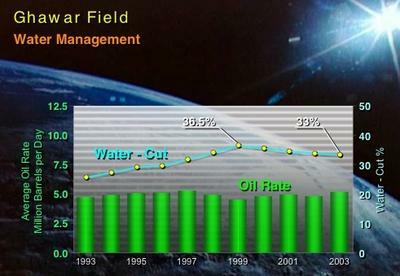 And that is only 5mbd away, according to Aramco’s former exploration head. Get it through your head JD, the peak is coming, and soon! 5mbd, a year or 2 or 5 leeway here or there…. It is coming. But don’t worry. Despite all your ‘debunking’ people are slowly getting the message, with Bill Clinton and the NZ Prime Minister now ready to talk about it openly. You’ll see JD, you’ll see. My point is not that oil will not peak. I've fully accepted the fact that it will peak, and it won't surprise me in the least, even if it peaks next week. My point is that we don't need oil. It's just a drug, and we're addicted to it. That's why the thought of it running out creates the sort of hysteria you are exhibiting. Smokers behave the same way when they run out of cigarettes. Quitting isn't that big of a deal though, if you look at it objectively. It hurts for a while, but you get over it, and feel better afterwards. However, I wasn't saying a ghawar peak = saudi peak = world peak. I in fact suggested Ghawar peaked in 1981! Anyway, I'll check your blog regularly to add some balance to the debate.